Reverend Gregory M. Aymond, Archbishop of New Orleans, gives a final blessing at ceremonies dedicating the Gayle and Tom Benson Science and Technology Complex at St. Mary’s Dominican High School. 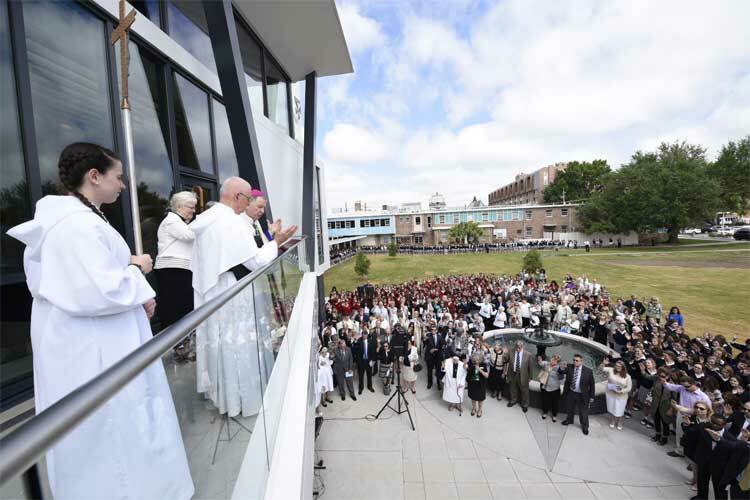 St. Mary’s Dominican High School in New Orleans celebrated the blessing and dedication of the Gayle and Tom Benson Science and Technology Complex during ceremonies attended by leadership, congregation members of the Dominican Sisters of Peace, benefactors, school officials, faculty and students. The event marked the culmination of 14 months of construction that began after Dominican’s announcement in September 2014 of the STREAM™ —Science, Technology, Religion, Engineering, Arts and Math – initiative and unveiled construction plans. 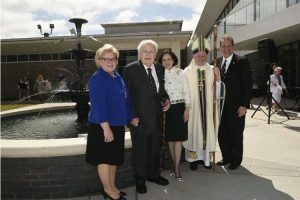 At the April 22 blessing and dedication of the Gayle and Tom Benson Science and Technology Complex at St. Mary’s Dominican High School in New Orleans (from left) Dr. Cynthia A. Thomas, president of St. Mary’s Dominican High School; Mr. Tom Benson and Mrs. Gayle Benson; Most Reverend Gregory M. Aymond, Archbishop of New Orleans; and Scott Whittaker, Chairman of St. Mary’s Dominican High School’s Board of Directors. STREAM™ impacts three areas of ongoing improvement at the 155-year-old school: formation, curriculum and campus facilities. It is designed for the exploration of the relationship between faith and reason by integrating science, technology, religion, engineering, arts and math. STREAM™ continues Dominican’s unique role in the formation of students who are believing thinkers and thinking believers. “The Dominican Sisters of Peace are thrilled that our young women now have a state of the art facility where they may be prepared to become exceptional leaders in science and technology. This bold initiative is in keeping with our Dominican heritage and provides a fertile environment that showcases the harmonious relationship between faith and science in our Catholic tradition,” said Sr. Patricia Twohill, O.P., Prioress of the Dominican Sisters of Peace. Most Reverend Gregory M. Aymond, Archbishop of New Orleans, celebrated Mass and blessed the complex. In gratitude for their commitment and generous support, Dominican President Dr. Cynthia A. Thomas presented to Mr. and Mrs. Benson a glass sculpture of the complex’s Veritas Tower. The sculpture was by Mitchell Gaudet. “We are honored and fortunate to be able to assist St. Mary’s Dominican High School with the development of the Science and Technology complex. The timeless importance of education is paramount to our world’s future successes and with the light-speed development in these disciplines, specifically as it relates to the studies of science and technology, provide the educators and students the necessary resources to be on the cutting edge in their educational pursuits,” said Mr. and Mrs. Tom Benson. Architects were Blitch Knevel Architects, and the contractor was Donahue Favret Contractors, Inc. The Complex incorporates form and function with details reflecting the school’s 155-year legacy and its Irish roots. In 1860 seven Dominican sisters from St. Mary’s Convent-Cabra in Dublin, Ireland, arrived in New Orleans to teach the children of Irish immigrants. Dominican’s legacy is rooted in the tradition of prayer, study, community and service – the pillars of Dominican life and the foundation for the Dominican student’s experience. The Veritas Tower and Veritas shield celebrate the school’s Dominican heritage and the Church’s tradition of the dialogue between faith and reason. The fountain at the complex’s entrance is framed by an eight-pointed star and a compass. The North direction points to Ireland. The $10 million, two-story, 16,940 square-foot complex doubles the school’s pre-construction laboratory space. It is connected to St. Mary’s Hall and Cazale Hall whose second floor classrooms for science, physics and robotics were renovated. The complex’s St. Albert the Great Atrium features a sculptural design by Angela Gregory, a renowned sculptor who was a professor and sculptor-in-residence for two decades at St. Mary’s’ Dominican College in New Orleans. The art was inspired by the life and dedication of Albertus Magnus, O.P., who was canonized and proclaimed a Doctor of the Church in 1931. Also known as Albert the Great, he is the Dominican Patron of Peace and Patron of Natural Sciences. The Adoration Chapel is in memory of Katherine Raphiel McKay (SMDHS ’37), with love and gratitude from Ken and Jane McKay Blanchard (SMDHS ’67). It features a stained glass window, “I am the Bread of Life; I am the Light of the World.” Commissioned artist Stephen Wilson used glass from China, Poland, France, Germany and the United States to create the window representing the Body and Blood of Christ. The chapel’s wood tabernacle was carved by Patrick Ricard from walnut, cherry and African padauk. Its shape evokes the ark of the covenant sheltering the Bread of Life. The chapel’s location, directly below the Disputatio Room, “is a sign of the necessity for contemplative prayer to ready our hearts for the search for Truth together through disputatio,” noted Dr. Thomas. Outside the chapel is a Mitchell Gaudet commissioned glass work of four pillars representing Dominican’s tradition of prayer, study, community and service. The art work salutes major donors of the complex. The Ermina Wadsworth|Azby Fund Technology Center, across from the chapel, will provide the setting for students to analyze, synthesize, and articulate academic content in a collaborative, creative, technologically advanced environment. It is designed to strengthen students’ understanding and practice of responsible digital citizenship well-formed in Dominican Catholic values. In planning for the STREAM™ initiative, the school’s information technology infrastructure underwent a complete renovation, from the central data center to the personal wireless endpoint devices of the students, teachers and staff. This renovation allowed the school to establish a Virtual Desktop Infrastructure (VDI) that provides students a uniform means of access to curriculum contents anywhere on campus using their personal computing devices. New fiber optics at 10 Gigabits per second between the new network core and each of its distributed data closets across campus form a secure communications backbone that can be readily migrated from the current speed of 10 Gigabits to 40 Gigabits per second in the future. The Technology Center has five break-out rooms where students can work on research projects, in study groups and on other collaborative endeavors. One of the rooms is dedicated for video production. The Center also has a view of the Peace Garden, dedicated to the Dominican Sisters of Peace. The Azby Fund’s involvement with the school began in 1996 with the underwriting of the Erminia Wadsworth (computerized) Library. The library soon expanded into a computer learning center, and, eventually, a Technology Center. Michael Liebaert, Managing Director of The Azby Fund, said they were honored to be part of creating a learning environment for the students. “The Azby Fund has acknowledged and accepted the challenge of keeping pace with the revolutionary advancement of computer and internet technology,” Liebaert said. “When The Azby Fund initially committed to helping with the library, it did so with the expectation that equipment would break and become obsolete. However, the speed of innovation of computer and internet technology has exceeded the wildest predictions. “Today’s student seems to be all but required to be computer literate. Computer skills are now indispensable. The new complex and the equipment that it will house is a major leap forward, but we must stay mindful that the advancement of computer technology is an exponential curve. We must remain cognizant of the ever changing technology world if we are to provide the latest in innovation. The Science and Technology Complex is just the beginning . . . in the time it takes to push a button, it too will evolve,” Liebaert noted. On the second floor, the Holy Family Foyer was made possible through the generosity of Quinn and Karen Conrad (SMDHS ’74) Eagan of New Orleans. Among the area’s dedicated uses, it will be a meeting place for students and representatives from colleges and universities. It features a 7’ x 9’ giclee print reproduction of The Holy Family. The original painting by Belgian artist Joseph Paelinck, circa 1820, hangs at the J. Paul Getty Museum in Los Angeles, California. The painting was donated by Mrs. Joan McLaughlin of Munster, Indiana, in memory of the deceased members of the Shondel and McLaughlin Families. Mrs. McLaughlin is the sister of Bro. Roger Shondel, O.P. who is a member of the school’s Guidance Department. Across from the foyer is the Science Wing, made possible through the generosity of the Denault Family. The Science Wing is comprised of the Chemistry Laboratories. In addition, there are Life Sciences classrooms for Anatomy and Biology, and a Science Research Laboratory. Last fall, the SynDaver™ Surgical Model debuted at Dominican, making it the first high school in the United State that has one. The SynDaver™ is an elaborate and sophisticated full-body surgical simulator that will be used in the senior and junior Human Anatomy classes. The Disputatio Center, located directly above the Adoration Chapel, will be a place where students, faculty, alumnae, visiting educators, and professionals will come together for in-depth discussions, integrating faith and reason. In the Center is a marble statue of St. Thomas Aquinas, Doctor of the Church and Patron of Catholic Schools. The statue was originally located at St. Matthias Elementary School in New Orleans. It was given in gratitude for the Dominican Sisters who taught at St. Matthias, the school’s graduates who attend St. Mary’s Dominican High School, and the parishioners of Blessed Trinity Catholic Church in New Orleans. The statue’s relocation was made possible by Catholic Daughters of the Americas Court Mater Dei #868.